Oprah Winfrey speaks to USC Annenberg Class of 2018 at the Shrine Auditorium on Friday, May 11, 2018, in Los Angeles. Speeches have long been an important tradition at college and university graduation ceremonies in the United States. Every spring, schools honor students who have successfully completed their study programs. As part of the ceremonies, the schools often invite well-known and well-respected people to speak about their own life experiences and offer advice to the new graduates. Leaders in the arts, business and politics are among those who are asked to speak. What they say sometimes gains national attention; their speeches often examine the problems and issues the world is facing. This spring’s graduation speakers were no different. 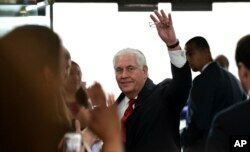 FILE - Outgoing Secretary of State Rex Tillerson waves goodbye as he walks out of the doors of the State Department in Washington, March 22, 2018, after speaking to employees upon his departure. Former U.S. Secretary of State Rex Tillerson spoke at the graduation ceremony for the Virginia Military Institute in Lexington City, Virginia. He asked graduates to be thankful for all the people who helped them get to this point, including parents and teachers. He also discussed how technology helps today’s college students do much more than when he was in college. Comparing today’s graduates to those of years past and reminding graduates to be thankful are commonly heard subjects in commencement speeches. Yet Tillerson’s speech also included comments on how important truth is to democracy. Some news reports took those comments as a criticism of President Donald Trump. Tillerson did not mention the president by name. But phrases like “alternative facts” and “fake news” are terms that Trump and his representatives sometimes use when news organizations are critical of him. Trump dismissed Tillerson from his position as secretary of state in March. Oprah Winfrey speaks to graduates at USC's Annenberg School for Communication and Journalism at the Shrine Auditorium on Friday, May 11, 2018, in Los Angeles. In a graduation speech in Los Angeles at the University of Southern California, television star Oprah Winfrey also discussed problems caused by the spread of misinformation. She spoke during the ceremony of the school’s Annenberg School for Communication. Winfrey also made note of other pressing issues in America – including gun violence, climate change and economic and racial inequality. “You can’t go anywhere — you can’t stand in line at Starbucks, you can’t go to a party, you can’t go anywhere without everyone talking about how bad things are,” she said. Chadwick Boseman, star of the hugely successful “Black Panther” movie, made similar comments in his speech at Howard University in Washington, D.C. Howard University is one of the top historically black colleges and universities, or HBCUs, in the country. Boseman attended Howard University himself. The school has recently had its own problems. It faced a scandal and student demonstrations after school officials were caught misusing money meant for student aid earlier this year. Boseman spoke about the scandal and the deeper problems facing students -- especially as African Americans. "Many of you will leave Howard and enter systems and institutions that have a history of discrimination and marginalization," he said. 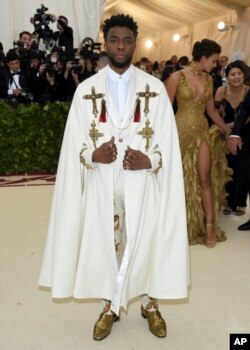 But both Boseman and Winfrey also offered hope. Boseman suggested that the problems they will have to face will only make them better people in the end. 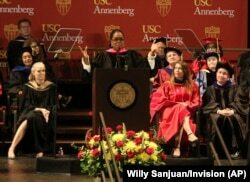 Winfrey offered clear advice for the USC graduates. She noted the power they can have simply by voting. If they feel their leaders are not doing what they want them to, they should vote those leaders out of office, she told them. Winfrey also argued that for almost any problem, young people could find a solution. All they need to do is act. 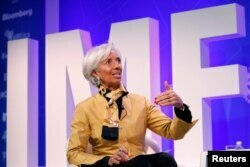 Christine Lagarde is managing director of the International Monetary Fund. She gave the graduation speech at Claremont McKenna College in Claremont, California. She asked graduates to look into their future to consider what effects their next choices and actions may have. Lagarde also asked the graduates to think about how different the world is now compared to 10 years ago, and how different it may be in 10 more years. And she asked them how they planned on making sure the world goes in the direction they want it to. However, not all the graduation speeches of 2018 had such a serious tone. Many speakers aim to use humor to build a connection with the graduates and make the ceremonies more enjoyable. Actor and director Michael Keaton did just that in the final part of his speech at the school he attended: Kent State University in Kent, Ohio. “I’ve got two words that I want you all to remember ... I’m Batman,” he said. Keaton played the popular character in two Hollywood films. Pete Musto reported this story for VOA Learning English. Ashley Thompson was the editor. We want to hear from you. What are some of your favorite graduation speeches that you have read or listened to? Write to us in the Comments Section or on our Facebook page.